Since 2008, Samuel L. Jackson's character Nick Fury has been an integral part of the Marvel Cinematic Universe, and it's hard to imagine anyone other than Jackson playing the comic-book hero. As it turns out, however, Samuel L. Jackson and his inclusion in the MCU is pretty much a legal obligation by Marvel due to a copyright infringement from 2001. In the early 2000s, when Marvel was in its lowest financial state, famous Marvel writer Mark Millar decided to try recreating a number of Marvel's most notable characters in order to adapt to audience's interests. He was desperate to keep Marvel from bankruptcy, and adapting and changing seemed like the only option for the Marvel writer. One of these changes was to Nick Fury, the Director of S.H.I.E.L.D. who would regularly be the guiding force for the Avengers. In order to attract audiences at the time, Millar worked with artist Bryan Hitch to completely redesign Nick Fury to look almost exactly like Samuel L. Jackson. Jackson had become well known for starring in movies like Pulp Fiction and Jackie Brown, and changing Nick Fury's appearance to look more like him certainly worked to bring readers back. As Millar later told Business Insider, he had not considered the legal repercussions to this creative decision. "Sam is famously the coolest man alive, and both myself and artist Bryan Hitch just liberally used him without asking any kind of permission. You have to remember, this was 2001 when we were putting this together. The idea that this might become a movie seemed preposterous, as Marvel was just climbing out of bankruptcy at the time." Unfortunately for Millar, Samuel L. Jackson was an occasional comic reader, so this blatant change to Nick Fury did not go unnoticed by the Pulp Fiction star. 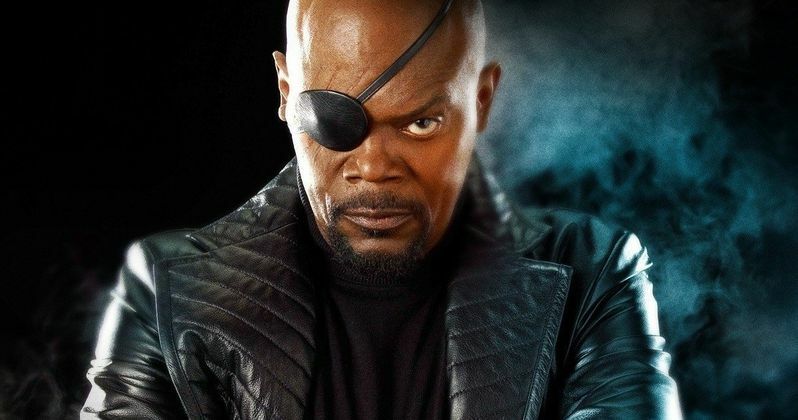 Understandably, Jackson almost took legal action, until he and Marvel made a deal instead: if Nick Fury were to ever appear in a Marvel movie, Samuel L. Jackson would be offered the part. It was a safe move from Marvel, as they were already on the brink of bankruptcy and likely would not have survived a lawsuit of that caliber. It was also a great move by Jackson, as it ended up giving the actor one of the best movie deals of his life. While the causation of this whole debacle was undoubtedly rather shady, both parties involved will agree that it worked out well. While promoting Kingsman: The Secret Service, which featured Samuel L. Jackson and was based on a comic series by Mark Millar, the comic-book writer apologized to Jackson for "completely exploiting" his look, and then asked if Jackson was angry with him. Jackson quickly replied, "F**k no, man! Thanks for the nine-picture deal!" It is safe to say that there is no bad blood between these two anymore. While there are still a number of Marvel fans who prefer Nick Fury's original look in Marvel Comics, the Samuel L. Jackson-based appearance of the S.H.I.E.L.D. director has certainly gained a lot of love over the years. Jackson has become a vital part of the Marvel Cinematic Universe, and it's hard to imagine anyone else playing the character. All in all, this is one case of copyright infringement that turned out great for everyone.